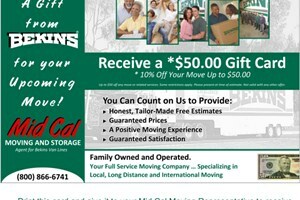 If you're searching for a dependable, accredited Stockton moving company, look no further than Mid Cal Moving & Storage. Our well-trained, professional Stockton movers work with both commercial and residential clients, providing quality local and long-distance services at affordable prices. As dedicated agents for Bekins Van Lines, a trusted industry-leader since 1891, we can even execute safe and timely international relocations to over 100 countries worldwide! Mid Cal has also earned an "A+" rating with the BBB and holds memberships with both ProMover and the American Moving & Storage Association. Call us to speak with a friendly Customer Support Specialist about our services today! For more information on Mid Cal Moving & Storage and the comprehensive Stockton moving services we offer, call us toll-free or fill out the quote form above for your no-obligation estimate today!